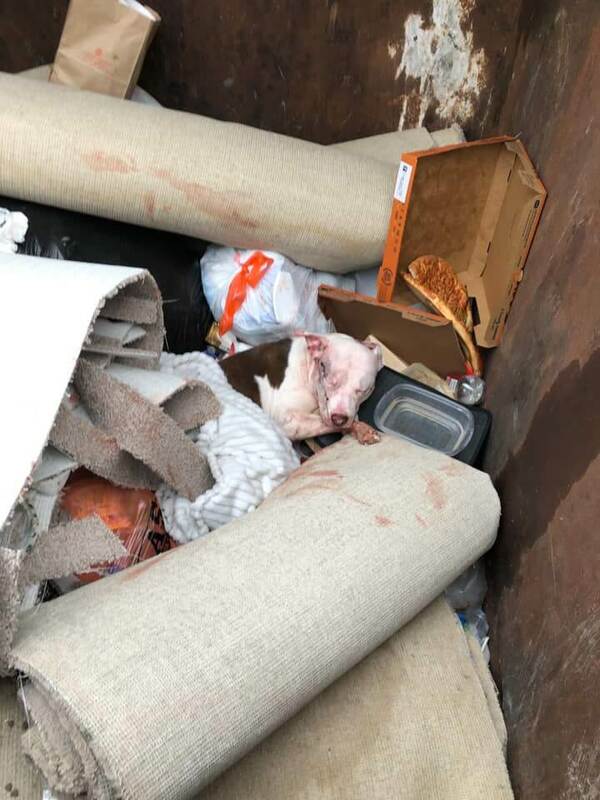 A two-year-old dog trembled and whined on Saturday evening after a Good Samaritan found her in a dumpster in an apartment complex in Northwest Houston. 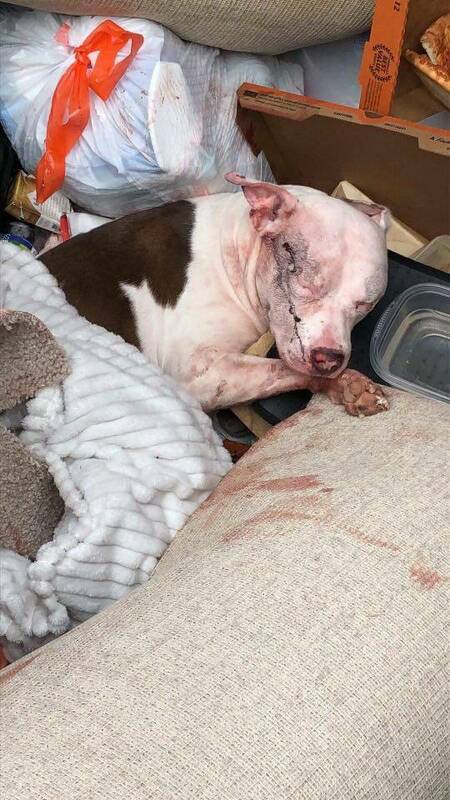 The dog suffered from head trauma and there she laid, barely able to move – surrounded by trash. 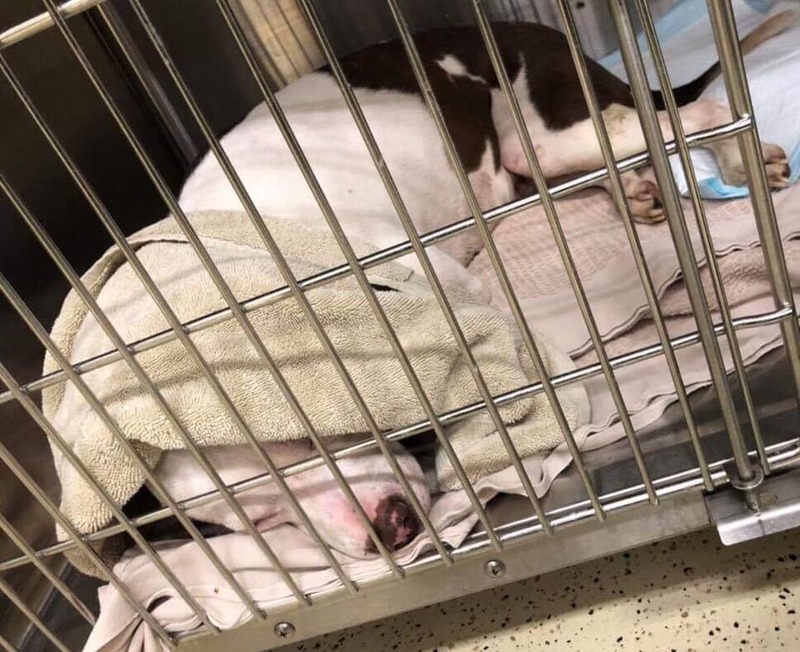 According to the A Chance to Bloom Dog Rescue, the dog, dubbed Karma was immediately transferred to an emergency veterinarian facility where she was shaking and in obvious pain from trauma to her face. 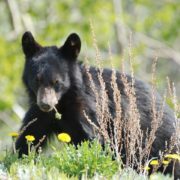 Dark streaks of blood stained the fur on her face which was swollen on both sides; more blood dripped from her nose. One eye was cloudy, indicating a loss of vision while her other eyelid protruded. Karma was able to stand, however she repeatedly spun in circles indicating a loss of balance possibly the result of her head trauma. 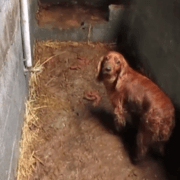 “…We picked her up and carried her to the car. She trembled and whined during the drive. It was obvious that this girl was in a lot of pain. 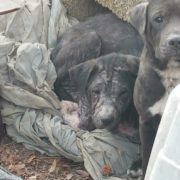 She was found just in time and was very weak. Karma would not have lasted much longer, bleeding out in the cold,” the rescue organization posted on social media. 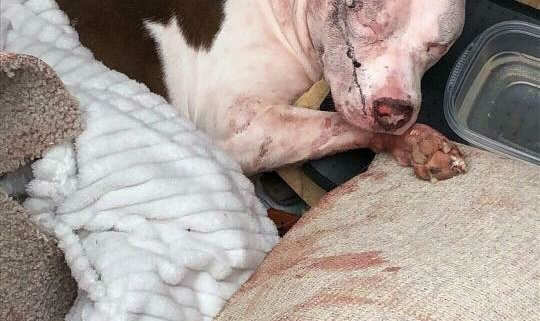 Although it is still uncertain what may have caused Karma’s injuries, it is likely a small hole could have been caused by a small caliber bullet. 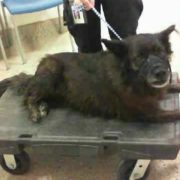 “Karma was admitted to new emergency clinic early this morning for a second opinion. Even after the first initial pain treatment, Karma could not get comfortable through the night. She tossed and turned in her bed, and cried softly in her sleep. She eliminated her bowels on herself and began to shake. There was just no way that we could have managed her condition on only oral medications. She needed to be hospitalized immediately. “Throughout the day, Karma began to regurgitate and was clearly uncomfortable. After pain medication, she has been able to get up and walk to relieve herself, but began to spin in circles. She became clearly uncomfortable after a short time and began to regurgitate. A nasogastric tube was placed to drain the contents of her stomach. Karma was also given anti-seizure medication, which finally helped her dizziness and rest peacefully. Karma will be transferred to Texas A&M in College Station, Texas for an MRI and consultation with a veterinary neurologist. 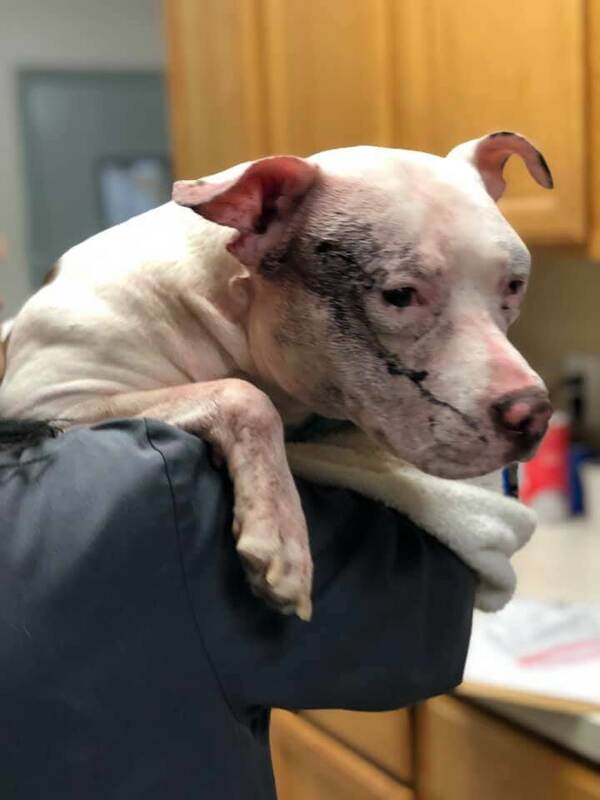 A $1,000 reward has been offered for information leading to the arrest and conviction of the person(s) responsible for this animal cruelty. 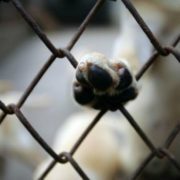 I pray Karma gets revenge on the vile monster that did this to her and recuperates in spite of her horrific condition. I hope she realizes she is in safe hands and can relax so that they can do their job to make her better. Please keep us up to date on her condition. 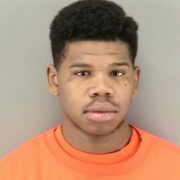 If only SUBHUMANS LIKE THIS could be thrown in the TRASH! Please help Karma! She is CRITICAL! What is wrong wi people. Why are they taking it out on these innocent loving babies. It usually seems to be texas also. I hope an pray 🙏 Karma will b ok!!! Thank u 2 all that have helped her!! 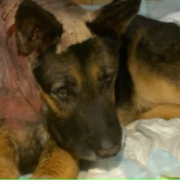 And I do hope they find the monster who did this 2 poor sweet, Karma!! (POPULAR MOVIE} SERIES “THE WALKING DEAD” ORIGINATED FROM!!! 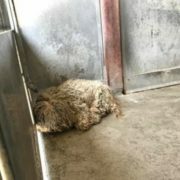 THE ABUSE AND MSITREATMENT OF EVERY SPECIES OF ANIMAL IN THIS MORONIC STATE TOPS THAT OF ANY STATE IN THE UNITED STATES…. WHAT THE HELL IS WRONG WITH THE POPULATION DOWN THERE! !